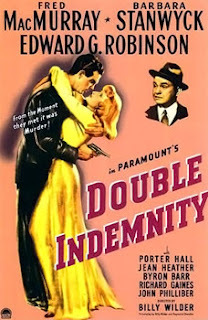 Double Indemnity based on the short novel by James M. Cain, is considered the ultimate film noir by many. In fact, some critics think the whole genre began with this classic. If it hadn’t been for director Billy Wilder’s persistence, Double Indemnity may never have made it to the screen. Just about every actor in Hollywood turned down the male lead and Barbara Stanwyck, Wilder’s first choice to play Phyllis Dietrichson, had to be talked into playing a cold, calculated killer. Fred MacMurray, who up to this time had played likeable leads in romantic comedies, was afraid playing Walter Neff might be a career-killing move. Before directing, Wilder had established himself as one of the best writers in Hollywood. He wrote or cowrote the screenplays for classic films like Ninotchka, Midnight, Ball of Fire, and Hold Back the Dawn, to name a few. In 1944, Wilder was still considered a novice, having only directed two films prior to Double Indemnity. Wilder’s first two films, Five Graves to Cairo and The Major and the Minor were well received by both the public and critics, but they were considered conventional films and didn’t do much to burnish his image as a director to watch. That was all about to change. highest paid woman in America. For many, Double Indemnity is the prototype for film noir. For sure, some of characteristics that we identify with the genre are in Wilder’s masterpiece. We have the manipulative femme fatale, the all-to-willing male protagonist, and murder, of course. We also have fast snappy dialogue filled with enough double-entendres to confound the censors of the day and delight 1940s audiences. The dialogue, written by Wilder and co-scriptwriter Raymond Chandler is masterful. Both loved language and it shows. Stanwyck, already noted as Wilder’s first choice, is the ultimate femme fatale. She not only manipulates MacMurray’s Walter, but us as well. We’re never quite sure what she’s thinking. MacMurray’s nice-guy image also works to his advantage. He seems like your typical, but harmless, wise-guy, not someone who would plan a murder for money and a “dame.” In a supporting role, Edward G. Robinson shines as Neff’s coworker and friend Barton Keyes. Keyes can spot a phoney insurance claim a mile away and he’s certain there’s something fishy about the Dietrichson case. Mix it all together with John Seitz’s incredible black and white cinematography and you’ve got a stylized thriller on your hands. Double Indemnity was nominated for seven Academy Awards including Best Picture, Best Director, and Best Actress. It was shut-out in all categories. The Leo McCarey hit, Going My Way was the big winner that year, capturing the award for Best Picture, Director, Actor, and Best Supporting Actor. Time has been kind to Double Indemnity. It was entered into the U.S. Library of Congress in 1992, selected for preservation in the National Film Registry. It was ranked #38 on the American Film Institute's list of the 100 best American films of the 20th century in 1998, and it was 29th on the AFI’s 10th Anniversary list in 2007. To purchase tickets for the March 12 screening, click here. Tickets are $5 per person general admission and $3 for students and seniors. Tickets may be purchased at the door. To stay on top of classic movie screenings in Chicago, join the Chicago Film Club by clicking here. Backstory: Barbara Stanwyck and Fred MacMurray were both at high-points in their careers. 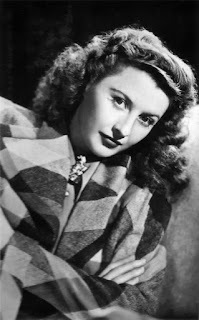 Stanwyck was not only highest paid female movie star in 1943, but also the highest paid woman in America. MacMurray was the highest paid male movie star and the fourth highest-paid American. With things going so well, you can understand why they may have been reluctant to star in a movie like Double Indemnity. This movie would have been gamble for both Stanwyck and MacMurray, but what a pay-off! I can't imagine any other actors in this film. It would be such a thrill to see this on the big screen. Yes, what a pay-off indeed! They're perfect, as is Robinson. Everyone is great.